October 23, 2015 By This post may contain affiliate links. 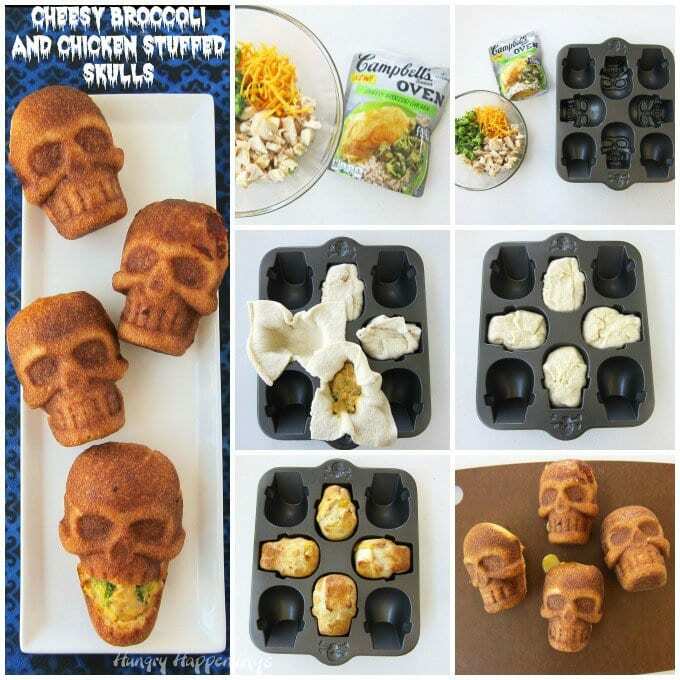 Scare up some fun this Halloween by serving some eerie Cheesy Broccoli and Chicken Stuffed Skulls. Each pizza crust skull is filled with flavorful cheese sauce mixed with fresh broccoli and chicken and will add some excitement to your Halloween dinner. Halloween is a busy time of year in my kitchen. My friends gather to help create treats for our party, and in turn I provide them with meals, many of which consist of take out food. The other day when I had a houseful of helpers, I decided to make dinner instead. I wanted it to be festive and fun yet quick and easy. In less than 20 minutes, the time it would take to drive to a restaurant, I whipped up 8 of these Cheesy Broccoli and Chicken Stuffed Skulls and popped them in the oven. 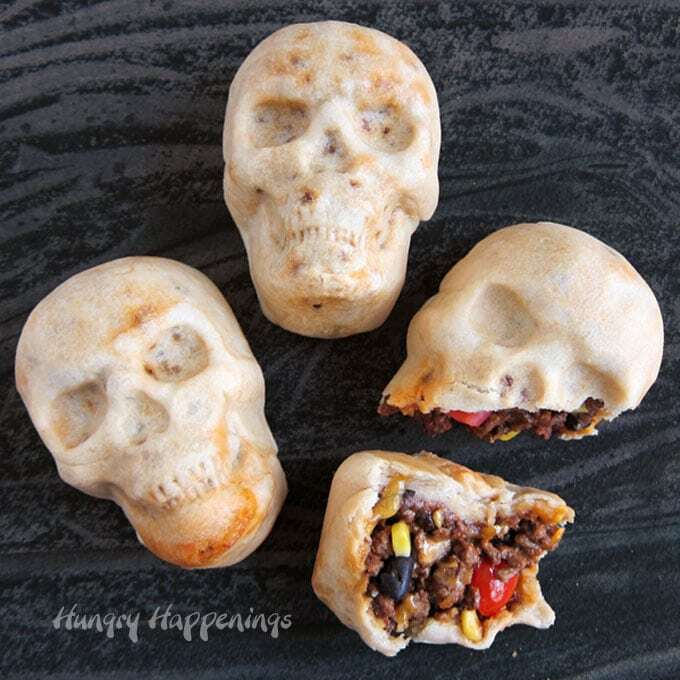 They are as easy to make as my popular Stuffed Pizza Skulls and quicker to make than my Burrito Skulls or Enchilada Skulls. After they baked to a deep golden brown, we dug in. Everyone thought they looked a bit creepy but really cool on their plate and were amazed by how yummy they tasted considering my lack of time spent in preparation. 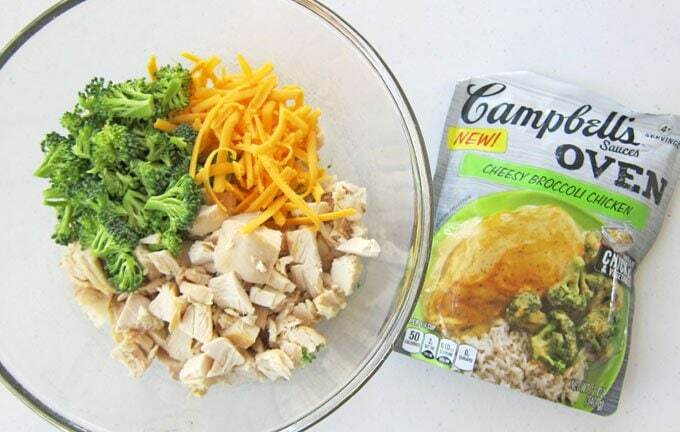 To keep this meal quick and easy, I used a new Campbell’s® Cheesy Broccoli Chicken Oven Sauce as the base of my filling. It’s rich and creamy and really flavorful, so all I needed to do was add some fresh broccoli, a bit of chicken and some shredded cheese. Sounds easy enough, right? Definitely something that can be pulled together before your kids head out to trick or treat. You’ll be happy knowing they filled their bellies with something tasty for dinner, so they wont spend all night reaching into their buckets and indulging in too many sweets. 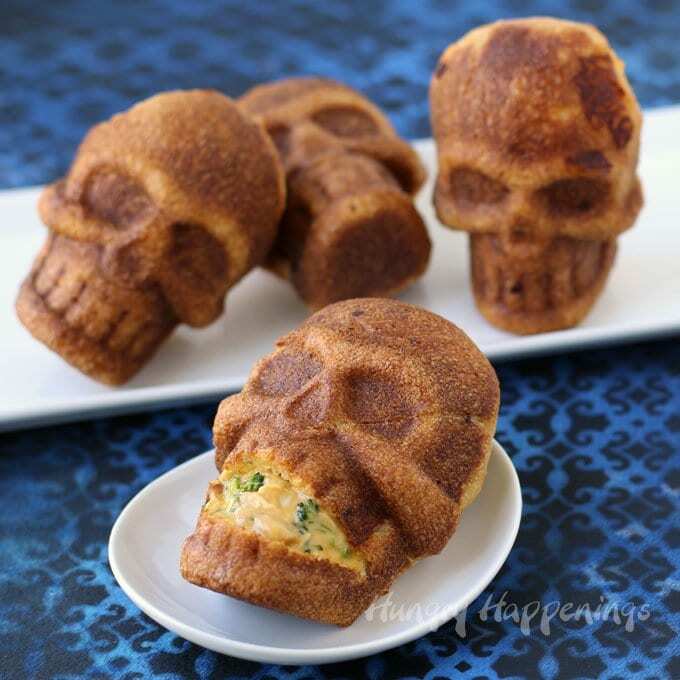 You will need two skull pans in order to create 8 of these stuffed skulls being only 4 have faces or just bake one batch at a time and reheat them when you are ready to serve dinner. As you line your pans with pizza dough, you will have a lot of excess dough hanging over the edges. Be sure to cut off as much of that dough as you can, pinching together the seams over top of your filling, so you don’t have a thick layer of dough on top. 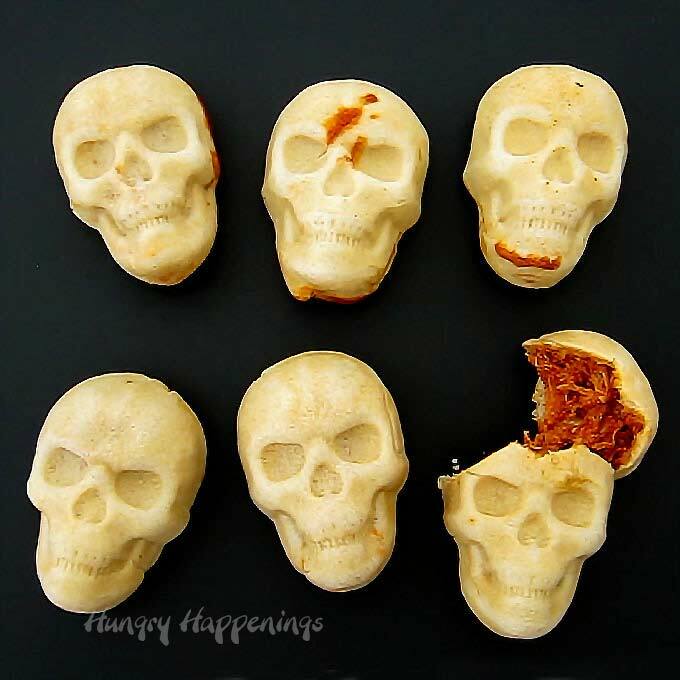 If you’d like to see a really detailed step-by-step tutorial on creating stuffed skulls and information about the skull pan I used, be sure to check out my Stuffed Pizza Skull recipe post. UPDATE: Sadly these Wilton Skull Pans have been discontinued. You can find Nordic Ware Skull Pans that are similar in size. Each of those pans has 6 skull cavities instead of 4. 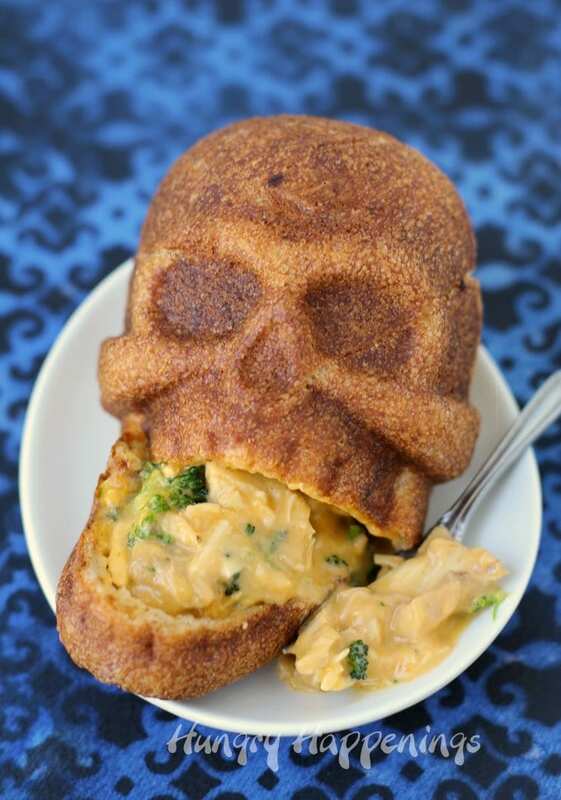 Pizza crust skulls filled with ooey gooey cheese sauce mixed with broccoli, chicken and cheese. Bake for 24-28 minutes until the top dough is baked through. I was given product samples and compensated by Campbell’s Soup Company in order to create and share this fun Halloween idea with you. You can find a wonderful variety of Campbell’s new products that make dinner prep super easy including Apple Bourbon Pulled Pork, Tavern Style Pot Roast, and Hawaiian Pork sauces. The pouch of Cheesy Broccoli Chicken Oven Sauce that I used for this recipe can also just be poured over chicken and broccoli and baked in a dish for a super easy entree. The new sauces can be used to create lots of delicious Campbell recipes. You can follow Campbell’s on Facebook and Instagram @Campbells. 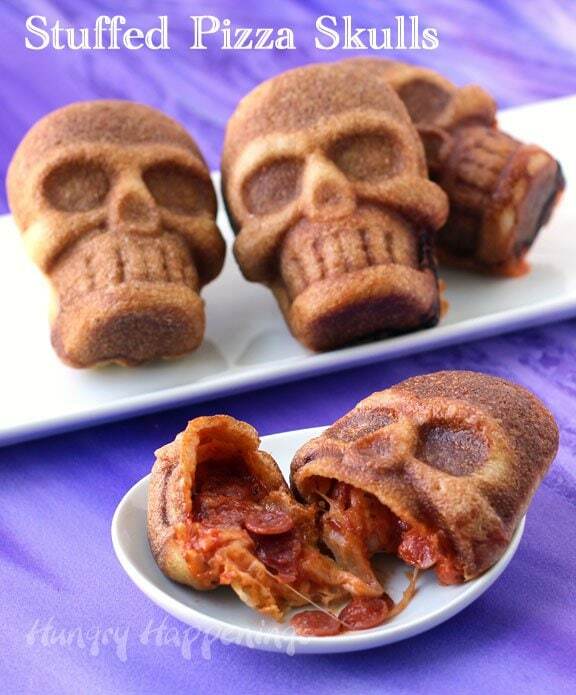 If you like these, you might also enjoy making these other creepy skull shaped meals for your Halloween dinner. 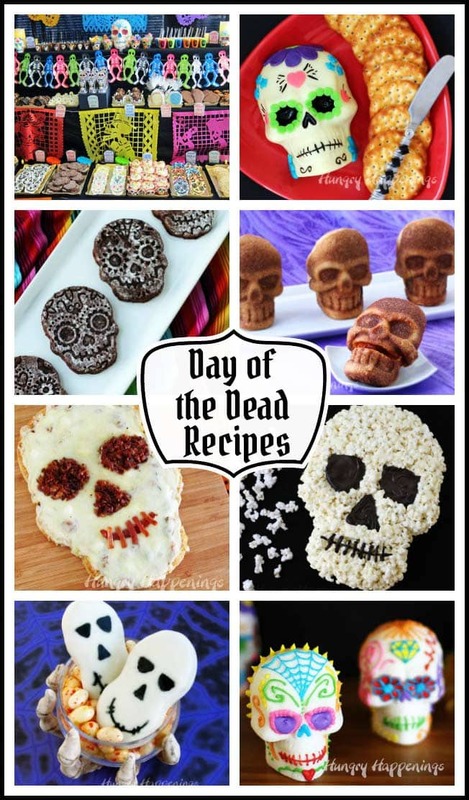 See more Skull Themed Recipes, here. Wow, Beth, these really look delicious in a gory sort of way! They would be so fun to serve, guests would DIE for them. Thanks:) They were fun to serve. I’ve been making these awesome stuffed skulls in prep for my own halloween party, and have a note/tip. If you’re uncoordinated like me, or are using homemade pizza dough, which can be a bit stickier and stretchier, try this alternate technique: form four calzones out of one batch of dough, close the seams carefully and then ease them into the skull pan. It’s easier for me to handle, as the dough wanted to stick to the other calzones when I tried to work one calzone in the pan at a time, and it was difficult to pinch and seal the seams inside the cavity itself. Just an alternate method. I love the idea of using that wilton pan to make savory stuffed everything! Thanks Phoenix for that tip. That is a GREAT idea! I hadn’t thought to do that and it does make a lot of sense especially when using homemade dough. I hope they turned out great for you. Happy Halloween. I’m so happy to hear your skulls turned out. I think sometimes things like scary black touches adds to the look of the edible craft. I hope you had a great Halloween. Where in the market do you find these pouches? I llooked all over the soup isle and the frozen foods. I found them at Target near the jars of sauces, like pizza sauce. At Kroger they were close to the macaroni and cheese. They are shelf stable pouches. Where do you find the pans to make the skulls. I always have a Halloween dinner and this looks so fun! Hi Cindy, you can find the pans on Amazon by using this link – http://amzn.to/2cFzRob. You may also be able to find them at JoAnn’s or Michaels during Halloween. Does the chicken breast need to be cooked before adding to mixture? Yes, you want to use cooked chicken. Loooooove this recipe. My 5-year-old could normally not care less about what I make, but is still talking about this dinner from three nights ago. It works perfectly with the large Wilton skull pan, if that what you happen to have. I used the same amounts of everything, except 1 tube of pizza dough did the trick with the large pan. The cook temp and time you used for the small pans also worked perfectly for the large – I did mix up and heat through the cheese sauce, chicken and broccoli before adding to the dough and pan, as I was worried with the larger version about it cooking through otherwise. So fun, thank you for giving me all new ideas with the skull pan! I am SO happy to hear that your child loved this recipe and really happy to know that it worked so well in the large skull pan. I think it was a great idea to heat up the chicken mixture though. You are right, the large pan holds so much more filling that it might not have gotten hot enough by the time the dough was baked. I have a large pan too. Now I need to try making something in it! Happy Halloween. Sadly right now they are all sold out, but they might be back in stock next Halloween.